Want to enjoy your favorite music, sport and news broadcasts while you wait toasts popping out from toaster? 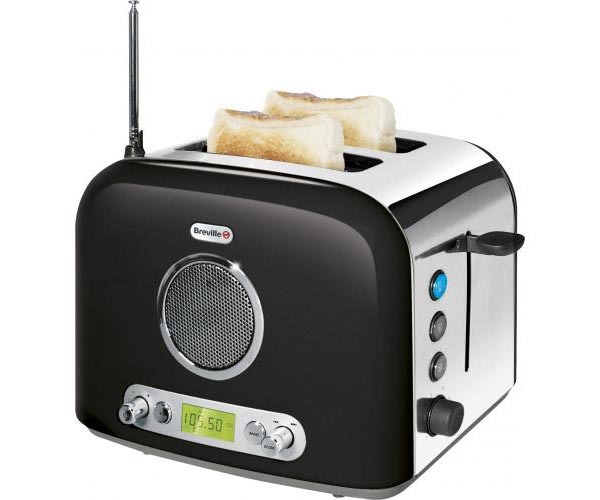 The Breville 2-slice toaster with FM/AM radio may be more suitable than a radio. As shown in the image, Breville VTT296 is a 2-slice toaster that comes with a built-in FM/AM radio. And you can store 10 pre-set radio stations in order to quickly access to your favorite channels. And the FM/ AM radio also features an antenna and a volume control. The 3.5mm audio jack also allows you to connect your MP3 player with the radio. Of course, mainly as a toaster, the two variable width slots make the toaster fit various breads with different thicknesses. And the browning control also allows you to choose how dark or light the toasts you’re toasting. Besides, the other features also include defrost, reheal and mid-cycle cancel functions, illuminated display and removable crumb tray. Breville 2-slice toaster with FM/ AM radio is priced at $68 USD. If you’re interested, jump to Breville official site for more detail. Additionally, if you need more options, you might like check the Star Wars Darth Vader themed toaster.